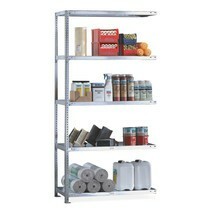 This shelf rack with tubular steel shelves is ideal for packaged materials and goods stored in containers. 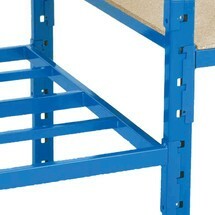 The add-on unit is quickly attached thanks to the boltless assembly system. 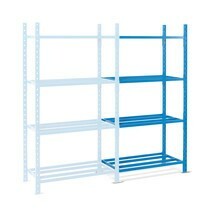 This shelf rack with chipboard decks is accessible from both sides, thus ensuring flexible use in your storage rooms in the form of rack rows. 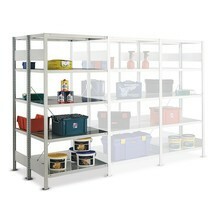 Assembly of this add-on unit is a breeze thanks to the simple and stable boltless system. 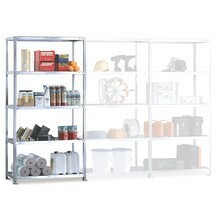 With this add-on unit, you can easily expand your shelf rack with steel plate decks. 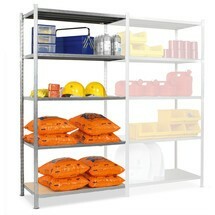 Simply attach the metal shelving system to your existing boltless base unit to create additional storage space in a flash. 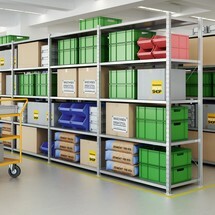 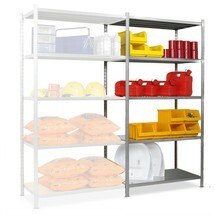 Shelf racks offer secure storage for your goods and consumables. 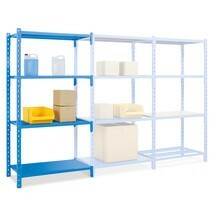 As a double-row shelf rack, this shelving system allows you to make maximum use of your space and is also suitable for storing heavy goods. 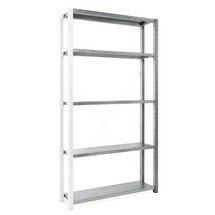 If you are looking for easily expandable and corrosion-resistant shelf racks, then this model is the perfect choice: The add-on unit for boltless shelves is robust and strong, and you can assemble it in a flash.